Any update on the likely release date for this? Id like to get a column-aligned keyboard, and I think the kinesis would be most suitable for me. Still, I don't want to invest in one and have a new improved model released the next day (or even month!). Re improvements: maybe a lower profile, and some sound damping or stiffening to make it quieter. I prefer a single-piece keyboard for convenience and a tidy desk, and that would keep costs down too I guess. As far as I know, the latest known is still "Early 2015". Eager to buy my 2nd Kinesis Advantage, but same as you describe, don't want to order now knowing a new release is coming soon. As far as I read with real function keys!!! +1. Would like to get an Advantage but this close to release date I'm going to hold off. Also, your FreeStyle Blue would be a fantastic keyboard if you hadn't put rubber domes on it. Any official statement about the status of the development of the new Advantage? I contacted Natas206 not so long ago. Hi! Sorry for the lack of updates. We had a few hurdles with the new firmware that we finally solved, so we've made tremendous amount of progress just in the past few weeks alone. We are getting closer! Still no ETA though, but beta testing should start soon. Here is my variation on that theme. 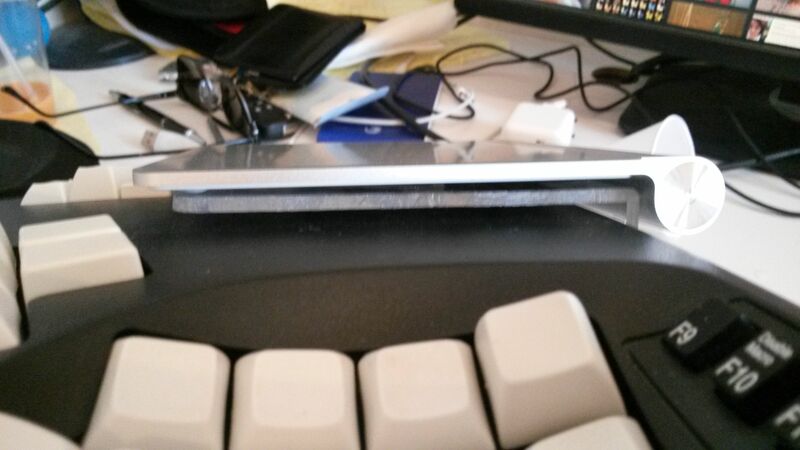 I had an aluminum plate machined to the same size as the Magic Trackpad. 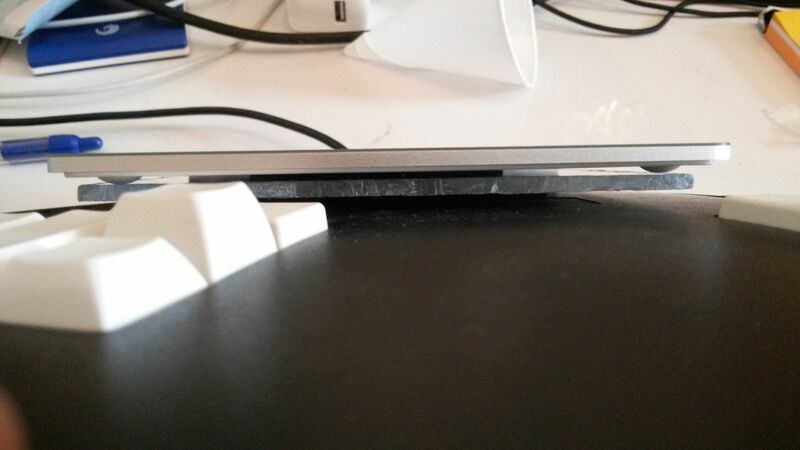 I applied a layer of velcro to the rounded front edge of the trackpad and left the rear edge floating. The front velcro acts as a hinge allowing the rear buttons under the pad to press on the plate. Lastly, I velcroed the plate to the keyboard. I'm another waiting on feedback on the new release. I recently have my Advantage die on me and something I'd really like is more substantial function keys... And well, after seeing this thread, I'm not go order one until further news on a refresh of this keyboard. What's wrong with your current keyboard? Often times there are easy fixes to get it working again (replacing the USB cable, firmware chip, etc.). It's worth contacting tech@kinesis.com to see what we can do. As for the updates... sorry guys still tight lipped for now. As pnutster pointed out, we're hoping to start beta testing soon (within 1-3 months). Oh, good to hear it's getting close to release. Does anyone know if this new keyboard has bluetooth, or if it's easy to mod the old one to have bluetooth? When you do, see what happens when you hold down seven keys at once. I'm working on a replacement controller for the old Kinesis that does bluetooth. It is probably still a few months away, but it is coming. Is there a good reason for needing more than 6 + modifier keys on an ergo keyboard? That sounds great. I take it that it's not straightforward to add bluetooth to the Advantage then? Well, there is the easy route of buying a USB to bluetooth adapter and shoving it inside the case, but I'm hoping to add some other features to my board. The pcb will allow for adding extra switches and I plan to add a trackball and/or trackpoint, among other things. I'm also hopeful that my board will have better battery life as I have control over how the thing sleeps, but software will be the last piece of the puzzle. The pcb will allow for adding extra switches and I plan to add a trackball and/or trackpoint, among other things. Wow, that would be great for upgrading old Advantages after new will come out. I hope you'll succeed (and hope to buy one kit)! Is it possible to be a part of beta testing? And as April 1st rolls by again... one more lap around the Sun. I really do hope to see at least two extra keys left and right below the shift keys. Why do you expect that? Why would they use ML instead of MX? They’re not really pressed for space. Tempted to get the 25% off on Massdrop: https://www.massdrop.com/buy/kinesis-advantage?mode=guest_open if it weren't for the fact that the new Kinesis Advantage is looming around the corner. The lack of updates on this frustrating at best. I think if there was a definite release date by now we would have heard it, as it is I've not even seen any rumors of a beta release so I would not get my hopes up. Keep in mind this is a company that is not known for moving fast; I'm typing right now on a 15 year old model (maybe more, it actually has an AT connector) that is by no means the first model they made, and it is virtually identical to the new ones. When I got this keyboard, my computer had 64 MEGS of ram, and that was a lot! As I think I expressed previously, bring me a mechanical, grid, contoured keyboard with true split and sufficient modifier keys and you can name your price. Me, on the other hand, despite the old keyboard in front of me now, my life moves fast. This whole keyboard thing could be a lot of enegry I shouldn't be wasting. I'm really starting to think I should put my 2 kinesis at the curb, forget I ever heard of alternative keyboards or ever learned Dvorak. Like learning to play the saxophone, wasted time for a useless skill I'm now embarrassed to carry. Don't give up. Hobby is a great time waster...admittedly. It's a great option for a keyboard with many mod-capabilities. I like the lists that are in this thread, and the one you've posted. New keyboard will come out eventually, the longer it takes the better it will be. A lot o advancements and the bar is being raised every few months. True-split is huge and that's the toughest sell it seems. But I picked up on that on Day 1. Kinesis maybe should not have mentioned having an update in the works. Be more like Apple, it seems to work for them. But it is DIY (at least for now). That means if you do not enjoy building it then it is the most expensive keyboard ever ... or almost. AWESOME PROGRESS ON THOSE PROJECTS! But as was mentioned earlier in this thread, an adjustable thumb cluster is crucial to ergonomics I've briefly discussed with Kurplop and believe he's been tinkering with a Kinesis for that purpose. You are probably right. Thumb cluster was the main reason I started Katy. 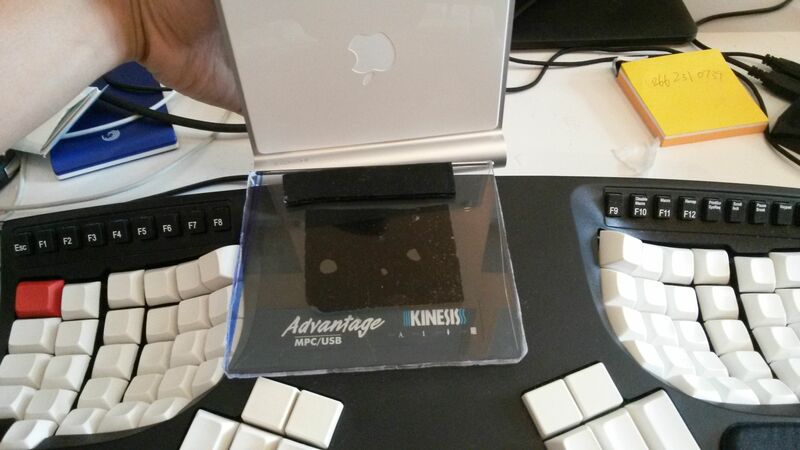 Otherwise I would just stick with Kinesis Advantage. You have a great project. I don't know if I've commented on it previously, but I'm impressed. Thanks for the efforts, many appreciate it! Also, I may finally get involved funding, marketing, pulling together several large companies for these types of products, so maybe at some point we can touch base as you get further along. I can say confidently the new version will not be available within 3-4 months. I am sorry it's taken so long. We had a number of setbacks that delayed progress and I really thought at the time we would have had a new version by now, but things happen. Definitely went for the 25% off deal. And now have to ponder about the recent additional options... RED LF hmmmmm - too many choices!!! Thanks for the reply. Now I know I don't have to check your website daily :-) Any teasers about the new keyboard in the meantime? Will the new Advantage model have a fix for the USB 3.0 issues with Windows 7? If so, will there be an upgrade path for existing Kinesis Advantage customers, such as swapping out the USB daughtercard? My keyboards are fairly recent models. How can I sign up to become a beta tester? I'm new to the board, and this is literally my first post. I stumbled across the site searching for a more elegant solution to the Windows 7 issue without having to use the PS2 adapter kludge. The kludge DOES work, but it bugs me on a fundamental OCD level. I have been very happy with my Advantage keyboards, with the exception of the Windows 7 USB 3.0 driver issue. Maybe get rid of the non mechanical keys and add a trackpoint? +1 for both of the above. I guess lots of people dislike the non-mechanical F keys on the Advantage. It's like a blot on an otherwise well-thought out device, and basically the one big thing that's preventing me from going for an item right now. Especially when doing sequences like Ctrl+Alt+Fx it's going to be weird hitting a non-mechanical key just for that last keystroke. Also, the big space in the middle of the two wells seems an ideal place for a touchpad (I never got the hang of trackpoints). You can move the LEDs (with a bit more separate please) to the top above the touchpad, and place the Kinesis/Advantage logos to the left and right of the thumb areas. It seems that that drop is over and right now 145 users are requesting a new one for a target of 200. Perhaps the new drop can target the new item? Is there any projected MRP cost for the new model and how much it will cost on a drop? I like the idea of making the function keys mechanical, but I'm opposed to adding a touchpad or trackball to the Advantage. I think that between the keys is an awkward place to put a trackball or touchpad, and I prefer to keep my mouse to the side of the keyboard. Just my opinion, of course. 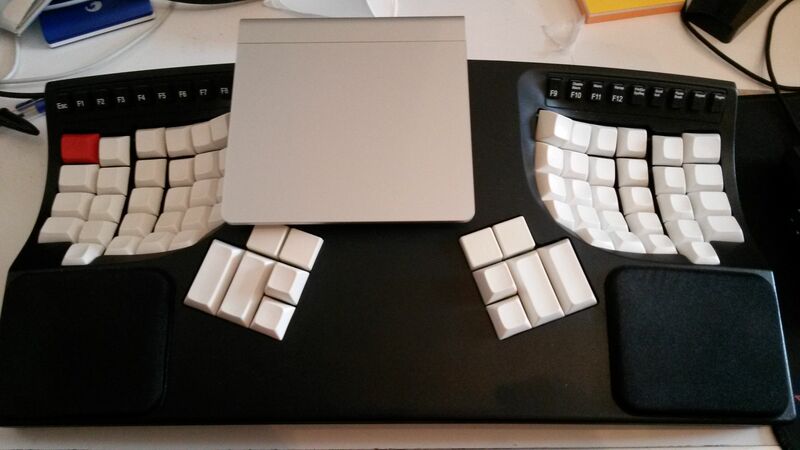 Hopefully if Kinesis DID implement something like that, it would be easy to completely disable. I'd be great, if the empty space wasn't stupidly curved, and I certainly wouldn't pay premium for a touchpad (or probably anything else for that matter, because I already have a decent trackball, which cost 1/2 of a Kinesis Advantage). But what matters....any ETA available? Any news for Kinesis? 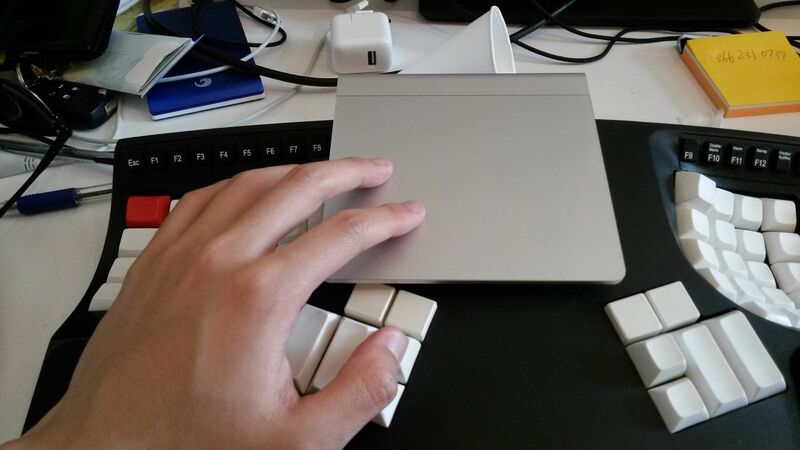 Only real answer to pointing device positioning is to split halves and I damn hope that's what Kinesis did. That way any device can fit on either side or in the middle, without forcing people to adopt whatever Kinesis may or may not be attaching to Advantage. Advantage is perfect for me but pointing device and its position are far too individual to have one size fit all adoption. Less important, but I'd love to see some crazy Japanese red lacquer keys edition, like that rare HHKB has. Also, the big space in the middle of the two wells seems an ideal place for a touchpad (I never got the hang of trackpoints). I currently have an Apple Magic Trackpad velcro'd to my Kinesis in-between the keywells, and I've ended up not using it that much. Without the ability to use the trackpad's hardware click, it's useful only for scrolling and the occasional pointing with tap-to-click. I'd much prefer a trackpoint in the same area, if only because I dislike having to do multiple mouse-like gestures to select/drag items over long distances (and the latency added to support that). Is this new version looking more like 2016? Debating if I want to wait at all. "I am here... on your desk!" Cmon guys, some new info? No, you do not want to wait. Almost nothing is on time. I would say the only difference is when a company announces something which is already made and stocked. But in such a case the expected release is always at most a month or two in the future. So if something is announced in a longer time frame then consider it vaporware. Buy the best you can afford now and replace it when something new and better is released. I'm not sure if natas206 is still keeping an eye on this thread (probably so, but one never can tell), but on the software side of the keyboard, can you make reprogramming the keys as easy as the keyboard layout analyzer on the patorjk.com website (http://patorjk.com/keyboard-layout-analyzer/#/config)? You can drag and drop keys from one place to another, or click on a key and change the character associated with it. Plus, you can put separate layers on each key from the same interface (Primary Key, Shift Key, Alt Gr, Shift + Alt Gr) and have everything clearly visible on the main screen. A keyboard that allowed changing layouts that easily, and exporting/importing layouts from one keyboard to another (which would allow easy sharing of layouts) would be awesome. (The software may already be set in stone, or perhaps a variation of the Ergodox configurator is being used, or something else entirely, I just thought I would ask). I really look forward to seeing pictures of it, then seeing reviews, then seeing it show up on Massdrop. the overall design of the keyboard is going to be pretty much the same. Noooo. Split it in half. Make two halves. You know you want to. Its not too late! Do it! Do it! USB compatibility while probably important for some does not change much for many others. It is forced compatibility 1.x upgrade, not 2.0 jump I was hoping for. Page created in 0.39 seconds with 81 queries.